I’m one lucky gal! Not only one but TWO bridal showers are being thrown for me in celebration of our upcoming June nuptials! I’m headed back east this weekend because two of my sister-in-laws are hosting the second bridal shower near where I grew up in Pennsylvania. In contrast to our Jack & Jill shower back in February, this shower is going to be just us gals! How does that translate to the invitation design? 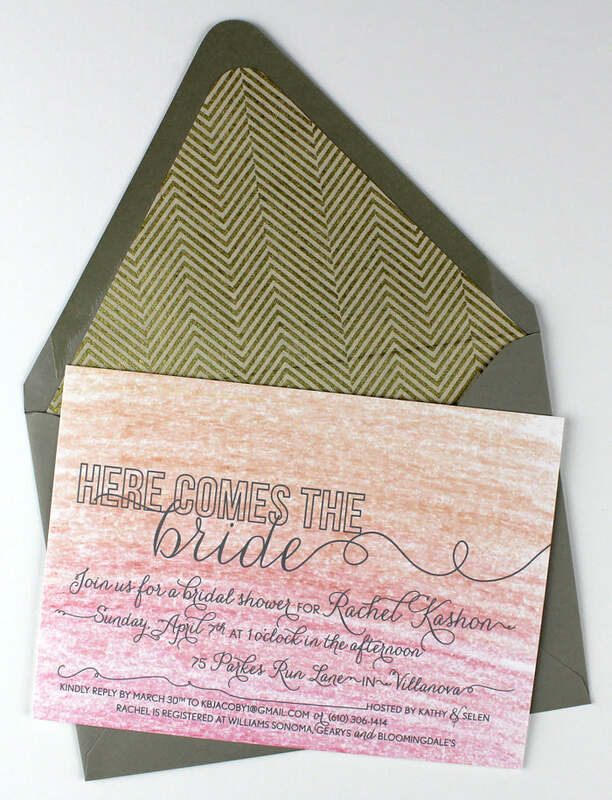 A pastel color palette with a pop of metallic gold and a font with lots of swoops and swirls! This invitation design started with the ombré background (hand drawn by yours truly!). It provided some color and texture upon which the slate grey typography was set. The swirly, curly and very girly Carolyna font is balanced by the clean lines of two sans serif fonts: Bebas Neue (outlined) and Nobel. (Psst, Bebas Neue is a free font download!) The modernity of the sans serif font is carried over to the color of the envelope and the clean lines of the gold herringbone paper used for the envelope liner. The liners were hand cut using Paper Source’s envelope liner template. For a quick refresher on how to line envelopes, check out my DIY video! Looking forward to sipping some bubbly, noshing cupcakes and catching up with all the gals!